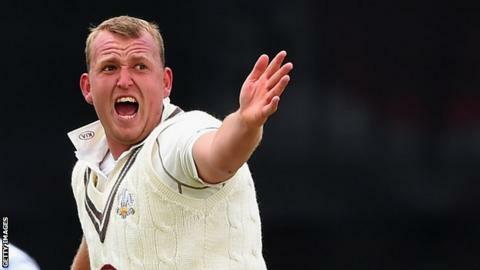 Surrey's loan paceman Luke Fletcher took 4-58 as his side enjoyed the better of day two at the County Ground. The hosts began the day 64-1 but Fletcher, on loan from Nottinghamshire, removed three Derbyshire batsmen to expose the middle order at 110-4. Tom Curran (3-38) then dismissed debutant Hamish Rutherford for 59 but Tony Palladino's 35 saw them past 200. In reply, Mark Footitt (2-40) bowled both Surrey openers, but bad light forced an early close on 77-2. Fletcher, known primarily for his limited overs bowling, showed his red ball acumen to have Ben Slater (28) and Wayne Madsen caught behind by Gary Wilson before he pinned Chesney Hughes lbw. Surrey's efforts with the ball gave them a first-innings lead of 32 runs and despite Footitt rearranging Arun Harinath and Zafar Ansari's stumps, the visitors managed to increase it to 109 runs before the umpires took them off for bad light. "Going home last night with Derbyshire 64-1, I was thinking we had a lot of hard work to do, but we stuck to our plans well this morning and that's why we got rewarded. "It was important for me to get the overs under my belt and it was nice to take wickets as well, so I am going away tonight with a lot of confidence." "I think the overhead conditions today and with the lights being on might have changed the way the pitch reacted, although they did bowl very well but it seemed the pitch had a bit more in it. "It wasn't unplayable by any stretch of the imagination but they put it in the right areas and asked questions for long enough."